Our latest website design Kilkenny project is the second of three websites we were tasked to build for Kavanagh Engineering, an expert and long-established provider of electrical engineering and other services based in Thomastown, Co Kilkenny. The company had recently expanded into the field of photovoltaic (PV) solar panels for both domestic and commercial use – i.e. solar panels that use natural light to generate electricity for use in the premises where they are installed. They wanted a dedicated website for their Photovoltaic Systems – and we were happy to oblige. We first performed diligent market research. This confirmed that installation of Photovoltaic Systems in Ireland is a growing business, with significant online traffic. 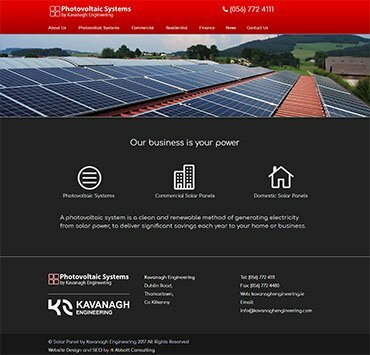 Armed with this information, we then devised a website structure to firstly show the benefits of photovoltaic solar panels, and secondly to show the benefits of choosing Kavanagh Engineering for their supply and installation. We agreed the plan with our client. Our copywriter then got to work on researching the field and producing content that would at once be informative and technical, while remaining accessible to the average householder or business owner seeking further information. Once the content was also agreed with the client, we then moved on to the website design and build. A consistent look and feel to the client’s three new websites was called for, and so our designer adopted the same general style as the client’s main Kavanagh Engineering site. This meant the same colour scheme and similar use of icon-driven marketing funnels on the home page, to reflect the effective and attractive look of the first site. Similarly, internal pages followed the same design principles, with strategic use of colour highlights and placement of calls to action. All customary SEO work was carried out at all stage of the build. We soon had a site which the client was happy with, and which we were confident would soon begin to rank highly for all key search terms.